Economy class return air fares from the UK (if booking our flight inclusive option). Suitable for anyone who enjoys hill walking. A rewarding trek through beautiful scenery beneath the spectacular Monte Rosa Massif. Trek in a beautiful valley with fabulous views of the Monte Rosa Massif and its glaciers. Walk through alpine meadows full of flowers and beautiful forests, walking well maintained trails. Stay in small friendly hotels of a good, comfortable standard. This is a lovely trip, offering a good walk but with enough easier stretches to allow time to look around and admire the great views and lovely landscapes. A comfortable bed each night and really excellent food make this a perfect week’s walking holiday. The Monte Rosa massif is best known for the classic, high altitude Monte Rosa Circuit. However, a new and equally picturesque route has recently opened on the Italian side, trekking through a beautiful region of forests, meadows and pretty villages set beneath spectacular peaks in an unspoilt corner of the Alps. Called the Monte Rosa Rando, this wonderful circular trek has been created by linking old footpaths and mule tracks to take in the whole of the Ayas Valley. The circuit starts in the bustling village of Champoluc, walking to historic Verrès in the Aosta Valley, and then past lakes and irrigation channels back along the other side of the valley and up to the spectacular glaciers of Monte Rosa, before finally returning to Champoluc. The whole circuit can be completed in six walking days, at a comfortable walking pace and takes you through varied and ever changing scenery of high mountains, woods, meadows and pretty villages. It is well maintained and graded throughout. Leading down from the glaciers of Monte Rosa the Ayas Valley has long provided a way through from the countries of the Alps to the plains of Italy. It was for centuries a route for traders and migrants, especially in early medieval times when the glaciers were evidently smaller than they are today. The languages and traditions of the valley reflect this cultural interchange and the many impressive medieval castles which you see along the route were built to control this movement of people. You start walking most days from the door of your hotel, most of which are small and family owned and offer very friendly, comfortable and attractive accommodation. In addition, restaurants along the trail offer a high standard of cuisine featuring local produce, including locally made cheeses and cured meats. Good wines are produced by the local vineyards and delicious ice cream is also made using dairy products of the valley. This is a rewarding moderate trek with 4-7 hours of walking each day through typical traditional alpine scenery with some wonderful panoramic mountain views. Meal arrangements: All breakfasts, picnic lunches on walking days and evening meals are included: 7 breakfasts, 6 picnic lunches and 7 dinners. Fly to Turin. Group transfer to Champoluc in the Ayas Valley. Group briefing by local guide. Walk to Arcesaz with visit to village of Salomon, the gold mine of Chamousira and the village and castle of Graines. Walk to Verrès through forest and vineyards. Climb from Verrès to Col d’Arlaz and then follow the ancient Ru d’Arlaz irrigation channel. Continue along Ru d’Arlaz, descending to Evançon River at Brussson. Explore Brusson old village. Walk to Antagnod via Napoleon’s Fountain and the Col de Joux and then along Ru Courtod. Visit traditional sabot workshop. Walk to Champoluc following Ru Courtod and then up to moraine of Verraz Glacier before descending to St Jacques village and finally along river to Champoluc. Transfer to Turin for flight home. Your guide will be a local English speaking guide. These guides are knowledgeable and enthusiastic about the mountains and culture of this beautiful region. 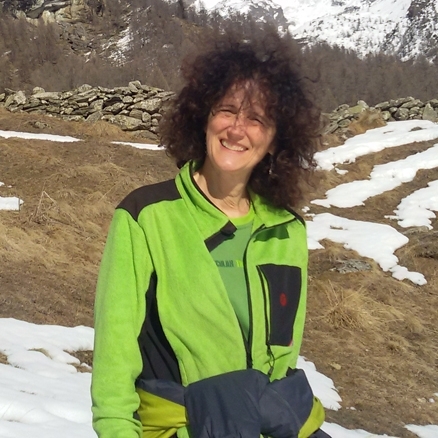 One such guide is Anna Ravizza, a charming guide who has farmed in the Val d’Ayas for many years and has walked all the trails of the valley. She is passionate about the mountains and culture of the region and loves to share it with visitors. Day 1 - Fly London to Turin. Group transfer to Champoluc. Fly to Turin. There will be one timed group transfer to Champoluc from Turin. If you are planning to book your own flights please ask about timing for this transfer as public transport to Champoluc can be a rather time consuming and is a complicated business. The journey to Champoluc takes you along the autostrada towards Aosta and then at Verrès you take the road which zig zags up into the valley of the Evançon River and on to Champoluc in the Val d’Ayas. Champoluc is the main village of the valley and is a bustling place with lots of hotels and restaurants. During the summer it is a centre for walking and in the winter for skiing. In Champoluc you will also find the Monterosa Terme, a spa with four warm pools, steam rooms and saunas. Once at the hotel you will meet your guide who will let you know details for the rest of your trip and then you will have dinner, either at your hotel or in a local restaurant. Day 2 - Walk to Arcesaz – 940m ascent / 1,067m descent, 7½ hours. Today your walk initially takes you along the banks of the Evançon River before climbing to the pretty village of Salomon from where you will have great views of the valley. You then continue through beautiful forest and climb to the disused gold mine of Chamousira. Mining in this area is reputed to date back to Roman times but this particular mine dates back to the beginning of the 20th century when it flourished for just a dozen or so years before the gold ran out. Walking through the woods you see the veins of quartz which contained the gold, and may also see evidence of shafts and galleries dating back to this period. You descend to the village of Graines. A tarmac road only reached Graines in 1974 and before that time, like so many of the little villages of this area, it was pretty self sufficient with its own school and village bakehouse. Nowadays only a handful of familes still live there. From Graines village you descend a short way and then make the short climb to visit the castle of Graines. This is a very picturesque ruin perched on a rocky outcrop, enjoying fine views up and down the valley. In early medieval times when the glaciers were evidently smaller than they are today there was a lot of trade across the Alps with people coming down this valley and into Italy. The Graines Castle was built to control this traffic. Up the valley you can see the village of Brusson with its blue lake where you will stay on Day 5. From Graines you descend in less than half an hour to Arcesaz (pronounced Archay-za) and your overnight accommodation. Day 3 - Walk to Verrès, 391m/1,282ft – 315m ascent / 1,253m descent, 5 hours. Another beautiful day's walking. You begin by strolling alongside the Evançon River, passing a couple of Roman bridges. You then walk through lovely woods and past the vineyards of Challand-St-Victoire and climb to the village of Omens. From here a good mule track leads all the way down to the town of Verrès, passing on the way the historic 14th century castle of Verrès, which you may be able to visit. The Challant family controlled this area in medieval times and this is one of several castles which they built - soldiers were garrisoned in this rather austere castle, whereas the Challant family themselves lived in some comfort in the more elegant castle across the valley in Issogne. The town of Verrès is situated at the bottom of the Ayas valley, and is your lowest altitude on this trip. It has a pretty historic centre and several bars where you might enjoy a cold beer as well as places serving delicious ice-cream. Day 4 - Walk to Challand-St-Anselme, 1,036m/3,399ft – 790m ascent / 160m descent, 5-6 hours. Today begins with quite a steep climb out of Verrès to reach Saint-Gilles Cross, but it is a well graded path and you will gain height rapidly and soon be rewarded with panoramic views. From the cross you can view the distinctive pointed peak of Mount Avic. You continue climbing to Ville castle and then on up through lovely woods of chestnut to reach Ville Lake Nature Reserve. It is a short diversion of just a few minutes from the main trail to visit the pretty, reed-fringed, glacial Ville Lake. From here you climb through the reserve past some fascinating 'land art', works of art alongside the trail created by a local artist from natural materials such as wood, leaves, twigs, tree branches and rocks. You continue ascending through lovely woods and flowery meadows to reach the Col d'Arlaz, 1,031m/3,382ft, your high point for the day and a fine spot with good views. At Col d'Arlaz you meet the end of the Ru d'Arlaz, an ancient medieval irrigation channel, and your trail now continues alongside this channel, so the walking is pretty easy for the next hour or so to reach the church of Sant'Anna and more good views. You then continue to Challand-St-Anselme and your overnight stop. Day 5 - Walk to Brusson, 1,326m/4,350ft – 755m ascent / 510m descent, 3½ hours. Afternoon at leisure in Brusson. After yesterday's ascent, today is an easier day, walking past Bechaz mine, another of the sites in the Monte Rosa area where gold prospecting took place. You again follow alongside the waters of the Ru d'Arlaz irrigation channel passing through farmland and forest before arriving back at the River Evançon River at the village of Brusson. Brusson is an attractive village set on a small lake and is a centre for walking in the summer and cross country skiing in the winter. You may take a stroll round the old village or visit the fromagerie on the edge of town, a co-operative which sells a fantastic array of local farm produce including cheese from cows and goats, all made with milk from farms of the valley, as well as other local food specialities. Day 6 - Walk to Antagnod, 1,681m/5,515ft – 630m ascent, 250m descent, 5½-6 hours. Today you join the Ru Courtod, an impressive medieval irrigation channel, and at 30 km long the longest in the Aosta region. The Ru Courtod took over 40 years to build in the years up to 1433 and was designed to bring water down from the glaciers of Monte Rosa to irrigate the lower valley round Challand-St-Vincent. You pass by Napoleon's Fountain where, in the year 1800, Napoleon is said to have chatted, unrecognised, with an Austrian soldier and arrive at the Col de Joux at 1,640m/5,380ft. You then walk along the Ru through forest of larch and red pine and finally descend to the village of Antagnod. Antagnod village is very pretty with narrow streets and ancient houses and is easily identified from afar because of its distinctive tall white church tower. By the time you reach Antagnod you are starting to get excellent views of Monte Rosa. On arrival in Antagnod you should have time to visit the workshop of a local sabot maker. These traditional sabots were once universally worn throughout the region and many local people still swear by them for comfort, durability and warmth. They have a distinctive shape which is very different to that of Dutch clogs. Day 7 - Walk along Ru Courtod to base of glacier, 2,069m/6,788ft, descend to St Jacques and continue to Champoluc – 730m ascent / 920m descent, 7hrs. Today the views of Monte Rosa are amazing and although you have quite a long walk much of it is pretty level. You walk along the Ru Courtod, through beautiful forests and lush alpine meadows where herds of contented cows graze, to arrive at a balcony with a fine panorama of the mountains. You then continue to the source of the Ru in the Cime Bianche valley which connects the Ayas valley with Valtournenche (Cervinia). Your trail then takes you round to the Pian di Verraz at the very foot of the Verraz Glacier and the highest point of your trip at around 2,069m/6,788ft. You descend through beautiful meadows and forests and on down all the way to the village of St Jacques. From St Jacques it is an easy walk to Champoluc alongside the river. Once in Champoluc you might have time to visit the Monterosa Terme, or to enjoy a beer to celebrate completion of the circuit, before your last dinner in Italy. Day 8 - Transfer to Turin/Torino airport. Fly to London. There will be a single timed group transfer today back to Torino airport for your flight home. Not quite ready to book? Why not call us on 0044 (0)1453 844400 to hold a no obligation place while you make up your mind? No surcharges will be applied to your holiday after you book. Prices on this website are updated regularly. The Flight Inclusive holiday price, or Land Only holiday price, will be confirmed to you at the time you make your booking. There will be no surcharges after your booking has been confirmed. The 'flight inclusive' holiday prices shown on this website are based upon our preferred airlines and the best priced economy class fares we are able to secure at the time of publication. We will be able to advise on fares with alternative airlines, upgrades to Business Class, and the options for flights from regional UK airports, please contact us for more details. Read holiday reviews by Mountain Kingdoms travellers. There are many ways you can extend your holiday with Mountain Kingdoms: book extra hotel nights, relax at a beautiful beach resort, take a warm-up trek, arrange a personal sightseeing tour or enjoy specialist activities such as rafting, birdwatching or a safari. We're happy to suggest ideas, provide quotes and make all the arrangements. We can also assist with flight and hotel upgrades. Just call us on +44 (0)1453 844400 or email info@mountainkingdoms.com and we will be pleased to help.